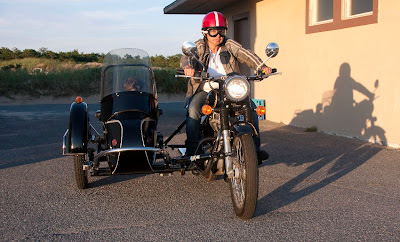 Seeing the world from a sidecar. Once a fishing and whaling center, Provincetown, Mass. 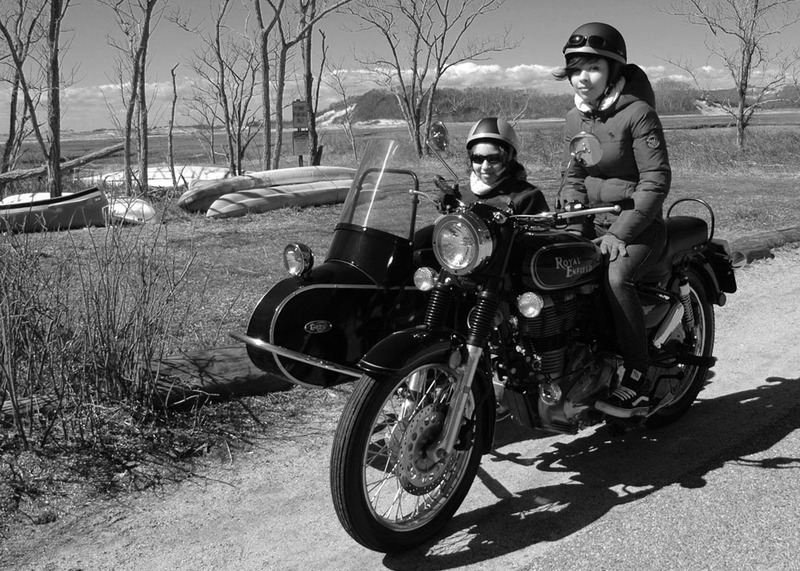 is a modern day vacation destination for tens of thousands in the summer, but one resident brings a vintage touch with her Royal Enfield motorcycle and sidecar. Photographer Terry Rozo and her little black dog Butch can be seen cruising around town and you can go for a ride, too. Terry offers a tour through the adjacent Cape Code National Seashore in the sidecar of her 2009 Royal Enfield G5. "Your ride includes a retro helmet and goggles, a stop or two along the route for photography opportunities, and a vintage style black and white photo of you in the Royal Enfield to print at home (she emails a digital file to you)!" The sidecar outfit seems to roll back the calendar. "My two passions are motorcycles and art, and this tour combines both. My route is what I ride to decompress after a hectic day. The photos I take are mementos for life, the images, eternal. People love it! "I'm licensed by the town of Provincetown and the Cape Cod National Seashore. All war vets and family can ride for free. I'm on the road from April to late October." Price is $60 according to her website. I asked Terry to describe why Provincetown is special, since she obviously loves it. "Sixty miles out into the ocean, we are at the tip of the Cape. Surrounded by water, the light has drawn artists since the first days of Impressionism. We are the oldest, and largest art colony in the U.S.
"Formally a Portuguese fishing village, it is now a resort with many bed and breakfast establishments. The 18th and 19th Century homes themselves, with their English gardens, are characters in the theater that is Provincetown. Provincetown gave its beaches to the National Seashore, assuring the preservation of nature along the Atlantic Ocean. "Drag queens, comedians, and bonafide Broadway stars perform nightly along Commercial Street... Provincetown is the unconditional loving Mother to a year-round population of those seeking their true selves."